Will Karnataka elections have an impact on Indian markets? The outcome of the Karnataka Assembly elections will have larger implications for the way the capital markets will view the future of reforms. The question is whether the anti-incumbency rule will continue to apply in Karnataka or whether Congress under Siddaramiah will get another term. But the importance of Karnataka goes beyond the elections. The outcome of the Karnataka Assembly elections will have larger implications for the way the capital markets will view the future of reforms. In the last 4 years, the BJP has managed to form a government in most of the key states and Karnataka remains the last bastion for the Congress. If the current opposition really wants to challenge the ruling NDA and create a grand coalition for the 2019 elections, then the Congress will need a decisive victory in Karnataka. The stock markets will be, therefore, watching the Congress performance closely in Karnataka to gauge the realistic possibilities of a grand coalition at the centre. The BJP has for a long time been a party that has dominated the North and the West. The South and the East had traditionally been out of bounds for the BJP. That has begun to change. While the BJP continues to dominate the states of the North and the West, it has now got Bihar, won Assam and formed governments in key North Eastern states. Additionally, the BJP has improved its vote share in West Bengal in the last state elections. South is where the BJP really needs to prove itself. Chandrababu Naidu has withdrawn support to the BJP, while the BJP could not make inroads into Tamil Nadu. Karnataka is the only state where the BJP actually has a substantial presence. Markets will be watching for the outcome as a victory in Karnataka will give the BJP substantial bargaining power vis-à-vis potential Southern allies. While elections are also due in Madhya Pradesh and Chhattisgarh, they have been BJP bastions for a very long time. It is Karnataka where the BJP really needs to prove itself. Over the last few months, a series of events, including the banking scam, have created doubts in the minds of people. A victory in Karnataka will affirm to the markets that the magic of 2014 is still alive and the reforms process is on track. From that perspective, it will also be seen as a prelude to the general elections in 2019 from a political and an economic strategy point of view. That is what the markets are really looking for. With the margin of victory much narrower in Gujarat and rising farm distress across India, there have been worries that there could be derailment of reforms in the coming year. In the last 4 years, the current government has shown a penchant for hard reforms like demonetization, implementation of GST, implementation of RERA, anti money laundering etc. The markets will not want a change in government at the centre to dilute these reforms. A victory for the BJP in Karnataka will be seen as a vote for continuity for hard reforms and that means there will not be any dilution of the reforms process. Karnataka in general and Bengaluru in particular have emerged in the last few years as the incubation capital of India. Most of the FDI into Fintech is also directed into the state of Karnataka. That segment may not be large from a capital market perspective but is likely to become much bigger in the times to come. The state of Karnataka will be keen to ensure that the current FDI flows continue unabated. For that, a strong state government will be the key. While that may not be too party-specific, the preference will be more for a stable government rather than the pulls and pressures of an unstable coalition. The weighty technology sector will surely vote for stability in the state of Karnataka. This will be the most important consideration from the stock markets point of view. Over the last few months, especially in the aftermath of Gujarat, we have seen a rejuvenated Congress. 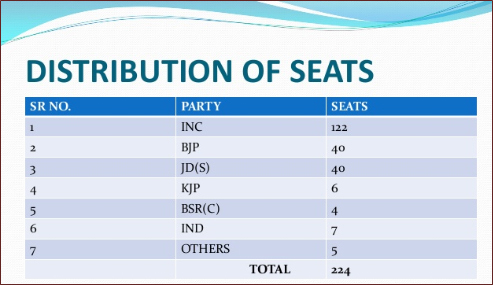 Whether the Congress can be the nucleus for a grand coalition will largely depend on how the Karnataka results pan out. If the Congress manages an emphatic win, then they could emerge as a serious nucleus around which the grand coalition will be built. That is the only way there could be a real challenge at the centre. If the Congress loses Karnataka, then it could be more of fractious opposition and may not pose a real challenge in 2019. The bottom-line is that despite all these factors, elections only impact markets temporarily. In the long run, the market remains a weighing machine and not a slotting machine!